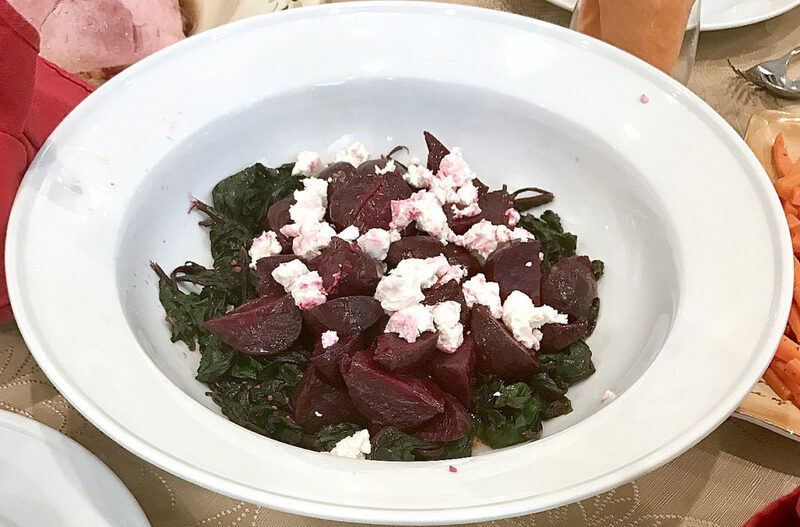 Beets, served with their own greens and feta cheese. Daphne had her four wisdom teeth pulled two days before Christmas this year. I am not sure why she chose this date. I do know that she cancelled her appointments about three times before this last time. The oral surgeon finally made me leave a deposit to ensure she would come. That tactic worked. I was able to take some seriously funny video of her after she was waking from the anesthesia. She wanted me to take her to see a friend. I told her she would thank me later when she realized why I wouldn’t comply with that request. I think she would have been really upset to have her friends see her with gauze in her cheeks, barely able to speak, and drooling. I took her straight home and got her propped up in my bed with a good movie to watch instead. Once the numbing wore off, she was in a lot of pain and couldn’t eat any solid foods. I blended her soups and gave her lots of vegan ice cream. As I planned the menu for Christmas lunch, I had to think of soft things for her to eat. I felt so bad for her. She looked like a little chipmunk with her swollen cheeks. Claud and I went a little overboard with the food for Christmas. We had 18 people over for the feast. We cooked carrots, brussel sprouts, turkducken, ham, potatoes, salad, dinner rolls, mushroom gravy, macaroni and cheese casserole, potato leak soup and beets. The beets and the soup were created for Daphne. I made the potato leek soup with coconut oil instead of butter and coconut milk instead of heavy cream. It tasted delicious. I don’t think anyone knew it was vegan. The soup was an obvious choice for her hurting mouth but I figured if I cooked the beets until they were very soft, they would be easy enough for her to get down without hurting herself. I like most vegetables but beets are not my favorite. Daphne absolutely loves them. That is the other reason I decided to make them. Actually, potato leek soup and beets are probably her two favorite foods. Her aunt, Maud, made beets for her in England a couple of years ago and she was hooked. Maud boiled them and then cooked them in a little olive oil and seasonings. Daphne wanted these all of the time after that trip. I buy them already prepared for her. This time, I wanted to make them myself for the first time. For this Christmas dish, I roasted the beets in olive oil for her and just sprinkled them with salt and pepper. She doesn’t eat anything dairy, so I couldn’t add butter or cheese to her beets. I figured I would like them more if I added cheese to mine. When I bought the beets, they had tons of large leaves. I couldn’t just throw those away. I decided to cook them and add the leaves to the dish. I looked up recipes and discovered that cooking the leaves is actually a thing people do. I tore the leaves off and sautéed them with butter, garlic and onions. I definitely advise any of you who plan to cook beet leaves to either wear something you don’t care about or an apron to protect your clothes. The juice in the leaves squirts everywhere and it is bright red. I had beet juice all over my shirt by the time I was finished. Luckily, I was still in my pajamas and didn’t mind too much. I ate the beets with the dinner and I have to say, I actually liked them. I think the goat cheese was the key to making them delicious. They also looked beautiful on the table. I didn’t make any cranberry sauce and the beets were a great substitute for that lovely deep red, which makes the meal look so pretty. As usual, we had too much food and will be eating turkducken, potatoes, and brussel sprouts for days. Actually, I think I am going to make a couple of care packages for my family. I forgot to do that as they left. However, one thing they will be missing in their packages is beets because they are all gone. I’m telling you, the beets were a hit. I think they are now going to be a holiday tradition. Preheat oven to 350 degrees. Wash beets and remove their leaves. Drizzle olive oil over the washed beets. Place in oven and bake for 40 minutes. While the beets cook, sauté the onion in olive oil. Add garlic. Add the beet leaves and cook until wilted. Sprinkle with salt and pepper. Remove beets from oven and gently remove their skin. Cut into one-inch chunks. Place greens on a plate. Add the beets. Top the beets with the goat cheese.